Undoubtedly, the sea is one of the main attractions of the island, if you do not own a boat, do not worry, there are countless places where you can relax on the soft black sand and enjoy the spectacular sea. Behind the landing there is a large beach made up of lava pebbles and separated into two parts by the pier. The beach located in a strategic point just below the area of ​​San Vincenzo offering a unique view of Stombolicchio. The northern part of the pier offers shelter for boats, but the southern stretches for about a mile until you reach the beach in Old Forge. The coast is accompanied by crystal clear waters. While north of Scari there is a large beach Ficogrande, this is the only one equipped with refreshments, umbrellas, deckchairs and a beach volleyball court, facing the Strombolicchio and so close that you seem to get around on swimming. 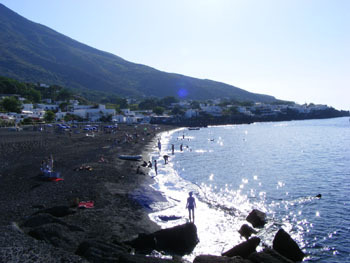 This beach is the most popular of the island and is made up of volcanic pebbles and black sand and an intense blue sea. Further north, along a small road at the end of Ficogrande, you will find countless alleys that lead you to the sea, go one an adventure and discover creeks made from volcanic pebbles or black sand separated from each other by ridges created by the lava flows. The road is marked by these coves reaching the long sandy Piscità very busy end of which you will find a rocky part where those who love a complete tan can relax and enjoy the sea. 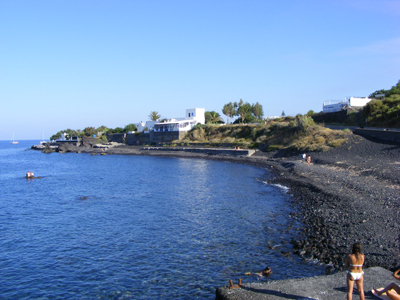 The beach at Punta Lena, is located at the southernmost piont of the island and is reachable only by boat, it offers a granite grey coastline where the waters have cobalt blue color. You are immersed in absolute peace where the the sylabbles of the wind and the waves crashing on the shore are the only sounds you will hear. 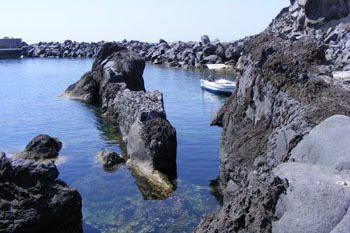 The pools of Stromboli are located on the western side of the island, in conjunction with the small village of Ginostra. Only accessible by sea, the rocks that surround the pier form natural pools that give the sea a color ranging from emerald green to indego, considered a treat for diving lovers due to the uniqueness and beauty that they hold. Located near Ginostra to get to the beach you must go down an old path that requires about a 15 minute walk from the small village. The beach is connected to the sea by a small______ that allowed the towing of vessel to a cave that opens onto the rocks. the beacj is made up of huge boulders polished by the erosive action of wind and sea. The area is known for the presence of an underwater arch that for all diving enthusiasts makes it one of the most beautiful attractions of the archipelago. 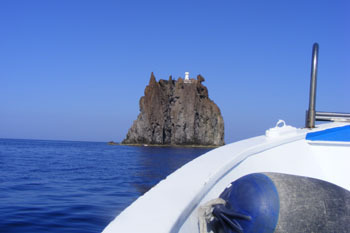 What better way to enjoy the sea from a small boat to discover the wonders of a coastline rich in sights and a way of seeing the residential areas of Stromboli and Ginostra. If you do not have a boat you can always rent or book a tour of the island, there are many compagnie for such that you’ll find near the port of Scari. Departing from this port you head towards the south where just past the Vecchia Forgia beach, you quickly arrive at Punta dell’Omo great for fans of diving due to the imense fauna and flora this area contains. It is advisable to take goggles with you that will allow you to enjoy the wonders of the sea at only a few meters depth. The distance that separates you from Ginostra is short, in this stretch between Punta Lena and Punta Lazarus, you can admire the beauty of the mountains, full of old lava flows that have shaped the landscape creating unusual gullies. At this point Ginostra is just around the corner, the “Pertuso” (hole) will welcome you, until a few years ago was called the smallest port in the world, nestled between the rocks forming natural pools of emerald green. Today the old port has been expanded with the construction of a dock for ships and hydrofoils. To venture down the steep trail that leads to the village, is like stepping back in time, where the modern life frenzy never came, and where small homes, many of which unlived in with original architecture remaining intact. 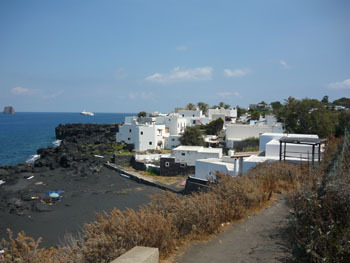 Returning to the sea in a few minutes you will be at the Sciara del Fuoco, a dusty gully where eruptive debris spills. Linger a few minutes and see how the rocks, due to the eruptive activity continue to roll down the slope, raising a cloud of dust as they pass, then crash into the sea, raising huge splash of water (obviously it is necessary to keep to safe distances). The tour continues until you reach the Strombolicchio passing by Piscità.